A trio of New York City daredevils--surely soon to be in the custody of the NYPD--filmed themselves riding atop a series of subway cars as trains barreled through Brooklyn and Queens. In videos posted to YouTube over the past three weeks, the train surfers are seen running, action movie-style, from car to car. In a clip posted July 14, the surfers hop onto the roof of a subway car from an overhang at the aboveground Avenue H station in Brooklyn. At one point, the future defendants have to quickly duck down to avoid being decapitated by an overpass. 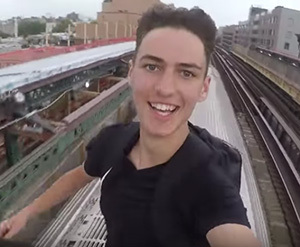 In a video posted Wednesday, the young men are seen riding atop trains traveling in Queens (at night and during the day). At times, one surfer is seen waving at straphangers waiting for local trains. He also made sure to pose for a video selfie, as seen in the still at right. The August 8 clip, complete with a jaunty soundtrack, can be seen above.